Accomplished portrait photographer, Richard Wood will be conducting an in person workshop in Los Angeles, USA which will take your Fine Art Portraiture to the next level. If you’re looking to delve into the realm of Fine Art, Rembrandt, Painterly style portraiture, Richard’s methods in both lighting and post production will give your work that beautiful, rich, moody look you’ve been searching for. This workshop will take you through the art of applying precise, beautiful Rembrandt style lighting on the face. Then, you will have the opportunity to photography ten different models all dressed to theme with their own stories. Day two will see Richard coaching you through the post production of your images with a whole other set of Lightroom and Photoshop techniques which are new outside of the current online ‘Creative Portrait Series’. You will also be taken through ‘beginner composition’ techniques which you can further enhance your portraits ‘story telling’ if you wish. Whilst much of Richard’s work is commercial and illustrative based for both clients and competition, much of his day to day work is creating beautiful Rembrandt style portraiture for families in New Zealand. Richard markets and sells a museum quality, high end, portraiture product through his New Zealand studio. WPPI PLATFORM CLASS - Las Vegas 27th Feb. Award-winning creative portrait and illustrative photographer, Richard Wood has created a course that challenges you to dive into your imagination and produce compelling images that evoke emotion and tell stories. Learn how to take an initial creative idea and turn it into an amazing piece of art with his masterful techniques in lighting, shooting, and post-production. In this course, Richard starts with the importance of storytelling, and how to best plan for your vision. Learn how to photograph the elements you’ll need to create your final image. Then, he takes us through 3 different concepts: A mermaid on land, a mermaid in water, and a siren – plus a bonus shoot he did in collaboration with Sue Bryce of a planetary goddess. Discover Richard’s secrets as he explains his Photoshop techniques from compositing, to color grading and using layers to achieve a result that will leave you awestruck. Once you master Richard’s key strategies to produce visionary images, your photography will become more powerful than ever! "Richard is an extraordinary illustrative photographer, his work embodies a beauty and richness that is rare indeed. "He is without doubt, one of the most extraordinary illustrative photographers in the world." Sue Bryce, Richard Wood - The Portrait Masters 2018. Phoenix, Arizona. In this tutorial we explore some natural Rembrandt lighting with the use of a single window. The name ‘Rembrandt Lighting’ is a broad term given to an image lit with a key light from the side. Whilst I’ve seen text book forms of exact ratios and angles of studio light setups, I prefer to sway from these. I have no problem in swaying away as these exact formulas as they are simply someone’s recommendations that have gone before and been written down. It could be easily taken as ‘gospel’ and all too often we can become scientists more so than we are creatives, which strangles our potential. I like to see the term ‘Rembrandt’ as a wide terminology for light coming from one side, much like the 17th century, Dutch painter, Rembrandt’s work. The style in which Rembrandt worked was known as ‘chiaroscuro’ where a three dimensional quality was created by detailing in gradients of extreme tone variations from shadow to light. Rembrandt wasn’t of course the only artist to practice this technique, but for him the name stuck. Possibly for the typical triangle of light which photographers often aim to achieve down the one side of the face. I could talk for hours on possible variations of lighting techniques to recreate this aesthetic, but let’s get down to some basics. Rembrandt for one had no flashy studio strobes, reflectors, soft-boxes and beauty dishes. Rembrandt, more often than not probably just had a window. Whilst a window sounds simple, I will admit I’ve had students struggle with this before, so we will look into how to make this a successful exercise in portraiture. Let’s look at some key points. Because we are working with available natural light, we should take a look at our options. If we have a soft, overcast, cloudy day outside the greater our chances will be of obtaining that beautiful soft light over the face. A harsh sunny day is going to create exactly that… a harsh strong light across our subject’s face. However, we can sometimes outsmart the weather by choosing a window on the side of a building that is facing away from the sun. We could also place some diffusion over the window. This could be a netted curtain, or a scrim from the outside. In the studio we would be setting ratios with possibly a main light and a key light. Ie Setting the different strengths of light for both our highlights and shadows. When using available light however, we are not always as flexible so our environment must be taken into consideration. The greater the the strength of light coming into the room in comparison to the ambient light in a room, the more contrast we will achieve (more mood). On the other side of the scale, when the light coming into a room is not much greater than the ambient light inside, the contrast and mood will lighten. Note that a large window will allow a lot of light into the room, making inside closer to what is outside. A smaller window will only allow a smaller amount of light into the darker space, thus not lighting the room up so much and will help to keep contrast on the subject. Whilst a large light source in comparison to our subject is most likely to achieve a softer effect, it can also light up our room too much. We therefore sometimes have to play with how far from the window we place our subject instead. As the closer our subject is to the light source, the larger it becomes in relation to them. This will also increase the contrast between your highlights created by the window light and the darks of the room. The further away from the window we place our subject, the more the light tethers off and becomes closer to that of the ambient light of the room, thus lessening the effect of our contrast. Finally, when teaching students, I often call this technique the ‘Gold Nugget’. I call it this because I feel once learnt, it can really change the way someone works with light. This technique is more commonly regarded to by photographers as ‘feathering’. I use this in both studio lighting and natural light. Judging by the beautiful softness Rembrandt achieved, I’m guessing so did he. 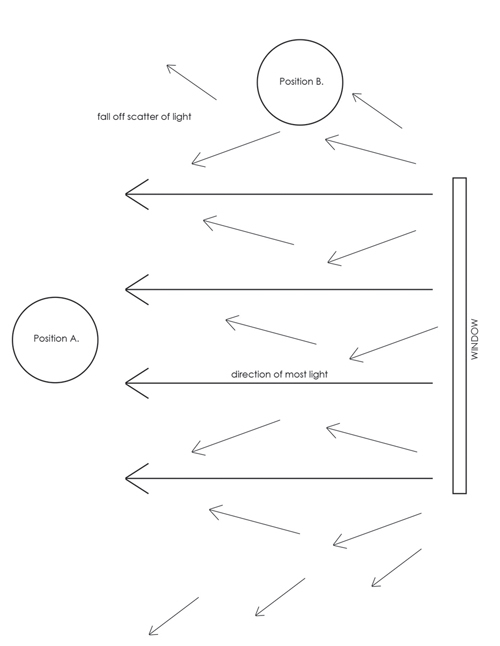 All too often I see photographers pointing their modifiers right at their subjects (Position A.). When I do this myself, I often find the light far too harsh for my style of work, even with the largest of soft-boxes. Instead I will more often than not use the more ambient light coming from my modifier or window. By just shifting my subject out of the direct path I can find a whole other quality of light. (Position B. ).